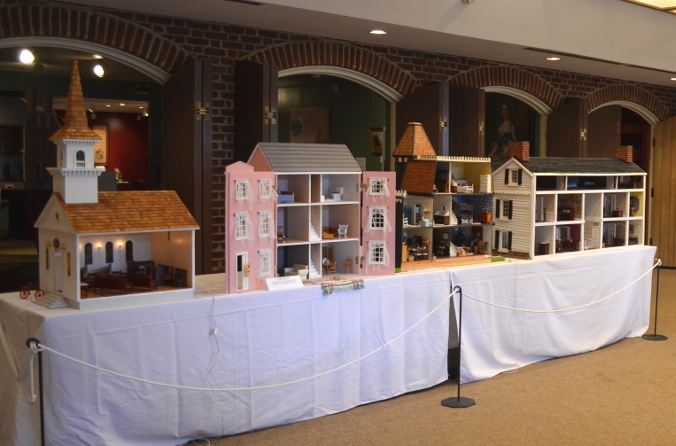 Dollhouses on display as part of our first-ever “A Wee Christmas” Dollhouses & Miniatures Show. This holiday season, we’re excited to share with our visitors the many dollhouses and miniatures loaned by friends, neighbors, and staff to form our first-ever dollhouses and miniatures show that we’re calling “A Wee Christmas at Historic Kenmore”. 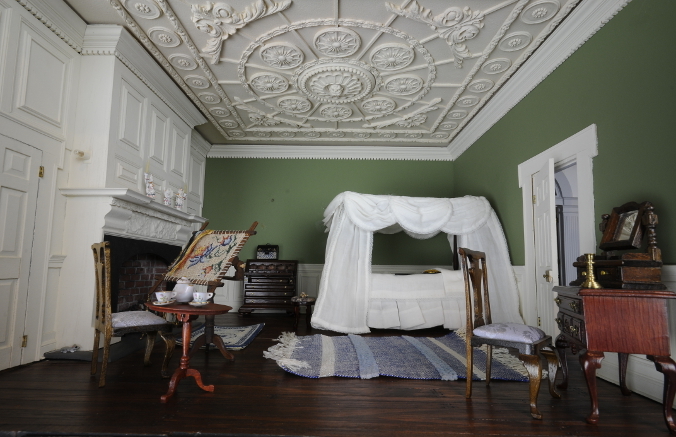 A highly detailed, replica dollhouse of Kenmore on display in our Crowninshield Museum served as the inspiration behind this new exhibit. Like its real life counterpart, this unique Kenmore replica has a fascinating history all its own. While on a visit to Fredericksburg in the spring of 1984, Florence White, an enthusiast of Georgian architecture, fell in love with Kenmore. She had been searching for years to find just the right place to make into a grand historical dollhouse. Kenmore with its simple, symmetric windows and imposing brick walls was perfect. The dollhouse version of Historic Kenmore. However, Florence needed someone who would construct this dollhouse with the degree of detail and intricacy that would mimic the elegant original. After a long unsuccessful search there came a chance meeting with Jim Freytag, a retired railroad man turned miniature enthusiast, and she knew she had her builder. Jim’s first task was to visit the home that Florence wanted to replicate and gather as many details as he could. He wanted to make it as structurally authentic as possible from the number of bricks between the windows to the outside steps worn down with years of use. He toured the house taking notes on the particulars of each room, the furniture, the décor, and the layout. Photographs were not permitted inside the house so Jim purchased postcards in order to get better detail for the intricate plaster ceilings and mantels. Some 2700 hours of work, 18,929 bricks and over $4000 later Florence had her Kenmore dollhouse. Jim had completed four bedrooms, a dining room, living room, drawing room, and study. They are each equipped with miniature pieces of furniture from a large cherry-stained Queen Anne table in the dining room flanked by two portraits of Colonel Lewis and Mrs. Lewis to canopy beds, brass candlesticks and leather boots in the bedrooms. A view of the Chamber inside the Kenmore dollhouse. 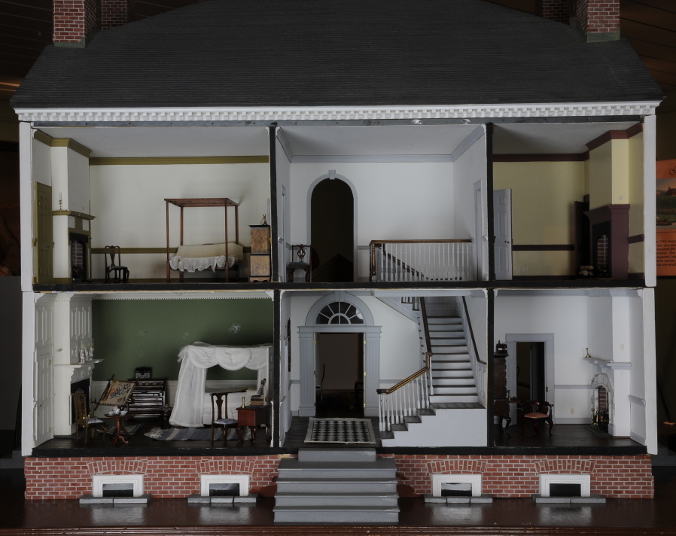 Over twenty-six years later, the dollhouse now sits in the museum gallery at Kenmore’s visitor center for all to view. Each room still has the exact furnishings so painfully and meticulously created by Jim and positioned to Florence’s specifications. The house is a time capsule which shows Kenmore before renovations completed nearly a decade ago. Visitors can see pieces of furniture that are no longer on display and can understand the dimensions of the upper floor rooms which are not currently open to the public. Florence’s devotion to detail and Jim’s immense skill leave us with a whimsical model of Kenmore which exudes all the elegance and beauty of the original that would have made the Colonel and Betty proud. You can see Florence and Jim’s replica of Kenmore as well as all the other wonderful dollhouses and miniatures that make up “A Wee Christmas at Historic Kenmore” until December 30.